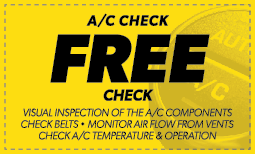 Whether you need auto air conditioning repair work done or just want to schedule an AC check, the best place to do it is at Meineke. You can schedule an appointment at Meineke in Tucson AZ today, using the Meineke website. Don’t forget to check for coupons while you’re there! Schedule your air conditioning repair work at your next earliest convenience!